The Griffins and Barons faced off for the second night in a row on Saturday in the second of a three-in-three home stand. Grand Rapids had the opportunity to avenge Friday night’s 4-2 loss. Coach Jeff Blashill had said that his team had not been showing enough resiliency, resorting to hanging their heads when things didn’t go their way. Forward David McIntyre mentioned that his team was not talking enough on the ice or shooting the puck enough. Now that the problems had been spotlighted on Friday, the Griffins set out to avoid them on Saturday. However, it did not start well for the Griffins. Just 18 seconds into the contest, C.J. Stretch deflected a shot past Griffins netminder Petr Mrazek, giving the Oklahoma City Barons a 1-0 lead. Giving up a goal on their first shift of the game has to be pretty deflating for a team, but each game is sixty minutes, and that’s what Blashill has stressed repeatedly of late. Grand Rapids would get its first power play in the, and they wasted no time converting on it. Center Calle Jarnkrok, who scored the game’s first goal last night, wristed a shot that teammate Mitch Callahan was able to tip in. It was just the team’s second shot of the game. But the momentum shift was short-lived, because Barons forward Steve Pinizzotto would regain the lead for his team just 1:28 later. 2-1. Edmonton Oilers rookie forward Mark Arcobello, who had nine points in four AHL games this season, added an assist. When the two teams took to the ice for the second period, the Griffins looked like a completely different team. They skated harder, made better plays, and in the process, created a lot of scoring chances. There were numerous 2-on-1 and breakaway opportunities, many of them to Callahan, who was all over the ice all night. The trio of Callahan, Almquist, and Jarnkrok came through on the power play for the second time. Callahan again scored, with Almquist registering the primary assist this time. The assist was Jarnkrok’s fifth point in his last five games. Three minutes later, Grand Rapids took the lead. Almquist fired a hard slapper from the point that was deflected by Trevor Parkes past Barons goalie Richard Bachman. The Griffins would head to the dressing room with a 3-2 lead. 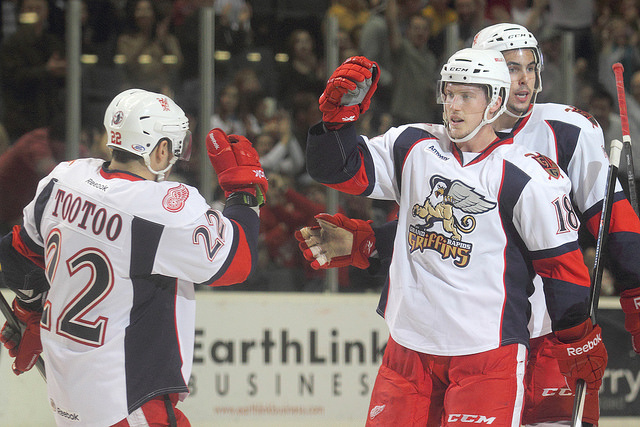 The Barons came out with enough energy to match the Griffins in the third. Defenseman Brad Hunt, who had scored two goals the night before, added his second assist of the night as he set up Arcobello for the tying goal. Grand Rapids could certainly use some resiliency now! Fewer than six minutes later, Jordin Tootoo set up Cory Emmerton for a perfect one-time slapper that was labeled for the back of the net. 4-3. After the Barons were in desperation mode, the Griffins managed to stave off the opposition for the remaining 6:46 to win the game. It was just the team’s fourth win in their last 13 games, and it snapped a three game skid. He earned the praises of his coach after the contest. Calle, along with fellow countryman Almquist and Callahan showed great chemistry all night, especially on the power play, where they generated numerous scoring chances and produced two goals. The trio combined for seven points on Saturday. The penalty kill was another bright spot for Grand Rapids in the contest. On Friday, they allowed OKC to score twice with the man-advantage, but managed to stifle all five of the Barons’ chances in this game. The Griffins earned two points and improved their record to 31-17-2-3 (67 points) but Chicago (66 points) is still hot on their heels in the Midwest. Grand Rapids will finish their MLB-like three-in-three Sunday night against Milwaukee. Same place, different team, different time (5:00 ET).